Preheat the oven to 135 C.
Whisk the egg whites until they start to form soft peaks. Start gradually adding the sugar while whisking all the time. Once the sugar has dissolved and the mixture has turned firm, lay a flat baking tray with baking parchment. With the help of a silicone spatula spoon, form two round meringues of about 20 cm in diameter on the tray. Even out their surface and bake in the preheated oven for about 50-55 minutes. Once the meringues are baked, don’t take them out from the oven immediately, instead leave the oven door ajar for next 25 minutes and let them cool down. After 25 minutes you can take out the meringues and let them rest. Next whip the cream until it forms soft peaks (be careful not to whisk it for too long as it might split) and start gradually adding the sugar along with the vanilla essence while still whipping. Reserve about a 1/3 rd of the whipped cream (Chantilly cream) on the side. You will need it for the top layer of the pavlova. In a separate bowl gently fold the remaining whipped cream into the chestnut cream. The easiest way is to initially fold just a small part of the cream and then add the rest. Choose one meringue as your base. Spread the chestnut and Chantilly cream on top of it. Place the second meringue on the top. Next spread the reserved 1/3 of the whipped cream on the top and even out its surface. 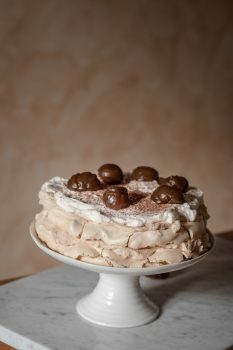 Grate some dark chocolate directly on top of the pavlova and decorate with marron glacés. As for decoration you can be creative, you could use other candied fruit to your liking. I like to break the sweetness with some red currants if I am able to buy them, which depends of course on the time of the year.